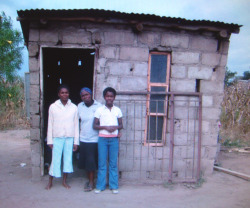 Jackie, 17, and her sister Laura, 11, live in a dilapidated one-room shack in the village of Welverdiend, within Bushbuckridge. Their mother died in 2006, leaving the girls in the care of their grandmother and father. In 2004 the girls suffered yet another loss at the death of their grandmother. To make matters worse, later that same year their father, their only provider, was involved in a road accident that left him paralyzed and permanently hospitalized. Jackie and Laura face daily challenges, such as, hauling water from the community water tap which is two kilometers from their home and rationing the food they receive to make it last. They comfort one another as they spend each night alone and vulnerable in their rickety room. When one of them is ill, more responsibility falls on the other. There is no parent around who can comfort them or nurse them back to health. Hands at Work has been helping the girls since their father was hospitalised last year; the girls receive weekly visits from a Home Based Care volunteer, Esther, who checks on their health, education, living situation and also on how they are coping with the daily struggles that they face. The girls are currently receiving a meal a day at the Hands at Work care centre, which is within easy walking distance of their house. Here they not only receive food, but also play games and interact with the other children at the care centre. We trust that they will understand that there are people who still care for them and are aware of the struggles that they face, and that this will encourage them to have hope for their future.